The International Exhibition and Conference on Higher Education (IECHE 2014) that concluded in Riyadh on Friday was the biggest ever event for higher education held in the Kingdom of Saudi Arabia. About 450 universities and educational institutions converged at the annual event. The United States doubled its participation with more than 100 universities taking part including Yale and Harvard. The United Kingdom had increased to 80 educational institutions this year, while Australia had over 25 universities represented. 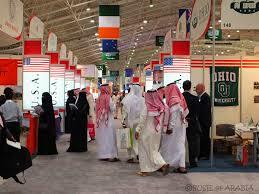 The exhibition is more than an opportunity for Saudi students to gain admission to foreign universities. It’s a unique opportunity for institutions to explore an array of ‘business’ arrangements including credit transfer programs, education consultancies and curriculum licensing. The Kingdom’s Minister of Higher Education signed more than a dozen institutional agreements during the event. The growing interest in the Kingdom is unsurprising. The Kingdom is undergoing a major education reform and investing hugely in scholarships, infrastructure and facilities. The King Abdullah Scholarships Program (KASP) will keep running until 2020. The Kingdom spends SR9 billion in scholarships each year. Since its launch in 2005, more than 130,000 students have studied abroad in 46 countries across the globe. Its however a pity that only 20 percent of its recipients are women. Over the last four years, King Abdullah announced a number of other education projects aimed at creating “world-class” higher education infrastructure across the country. In the process, the Kingdom is boosting higher education and research capacities. Its construction boom is driven in part by seven mega cities and several new portals of learning for male and female students. King Abdullah also laid the foundation stone for the second phase of the higher education project to establish several colleges worth some $21.7 billion. A total of 18 higher education cities and academies will be built or are currently being built in over 12 regions. The Ministry will also focus its efforts on improving the quality of education and management. This year’s national budget provides for a substantial allocation in education spending. Saudi Arabia has approved the Tenth Five-Year Development Plan. The budget will also boost the intake of universities, expand and diversity the post-graduate program with major focus on science and technology. New initiatives planned includes 10 research centres, 15 technological innovation centres in association with King Abdullah City for Science and Technology (KACST), and at least eight technology incubators at KACST and other universities. Another aspect of the kingdom’s ambition is to roll out of its second wave of the Colleges of Excellence (CoE) expected to operate in September this year in 22 different cities – last year 10 colleges were created in phase 1. More than 5000 students have already been admitted to these colleges out of 48,000 applicants. The plan is to establish 100 colleges by 2020 to accommodate 450,000 by 2023. These CoEs will provide vocational training in healthcare, business, IT and finance, hair and beauty parlor, fashion design and agriculture. These areas are chosen to create employment and meet the specific needs of various provinces.All programs are linked to various companies to offer on the job training and subsequent employment.